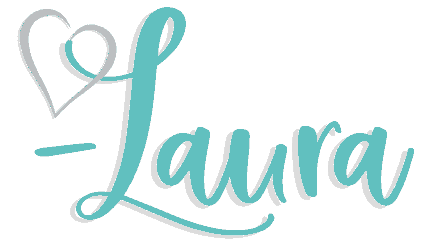 Blue Ridge Mountains, Shenandoah River, West Virginia Coal Mines, and country roads. Take me home to West Virginia! 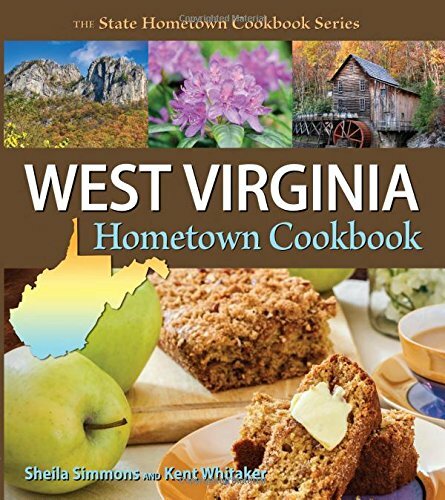 I’m excited to bring you a classic West Virginia recipe. 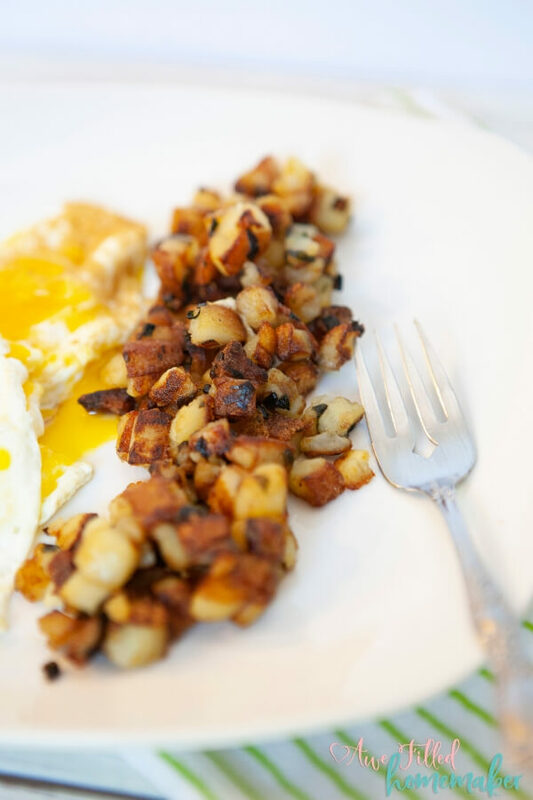 You’re going to love these Fried Taters & Ramps! 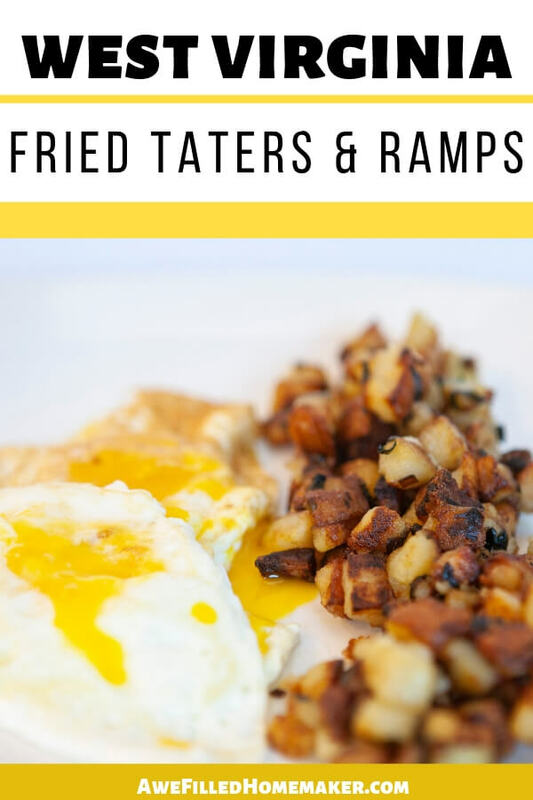 I’m certain that you all know what fried taters are, but what are ramps? Don’t worry, you’re not alone. My hubby didn’t know either. If you’re not from this neck of the woods, it’s probably not something that you’re familiar with and probably never even heard of. Not to worry, ramps are edible and delectable. According to my husband, they’re surprisingly really, really good! 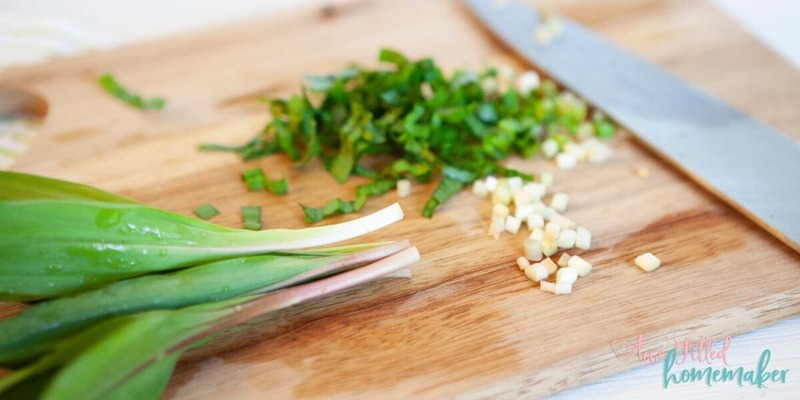 Ramps are leeks and they are found in wooded areas. Leeks? Don’t run away just yet! Ramps pop up early at the start of Spring and are quite delicious. Many people add them to foods instead of onions as they have that same type of taste and smell. 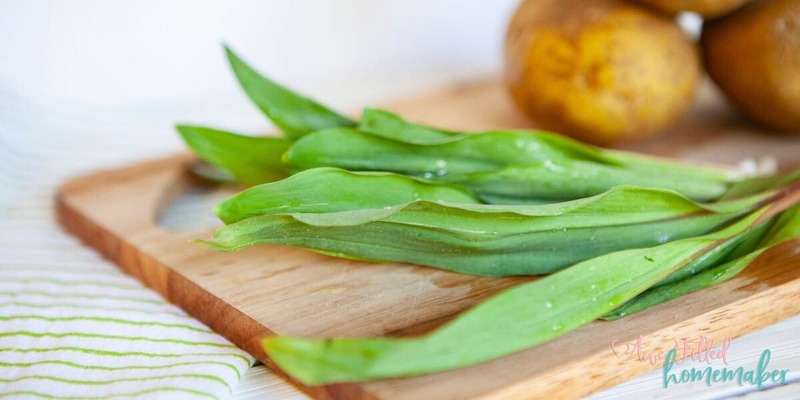 Can you eat ramps raw? Yep, you sure can. However, I will tell you that most West Virginians prefer ramps cooked and add them into their meals. On occasion, some will eat them raw in salads or garnish a dish. Be prepared though. I’ve eaten raw ramps and they do carry quite the taste. Eating them cooked and added into other dishes may be a better way of introducing yourself to the taste and concept. Why are ramps most known for being grown in West Virginia? The weather variances in the Appalachian mountains creates the perfect growing environment for ramps. At the beginning of Spring, the ramps are out and ready to be eaten. Not only do the locals eat ramps, but they also celebrate them! 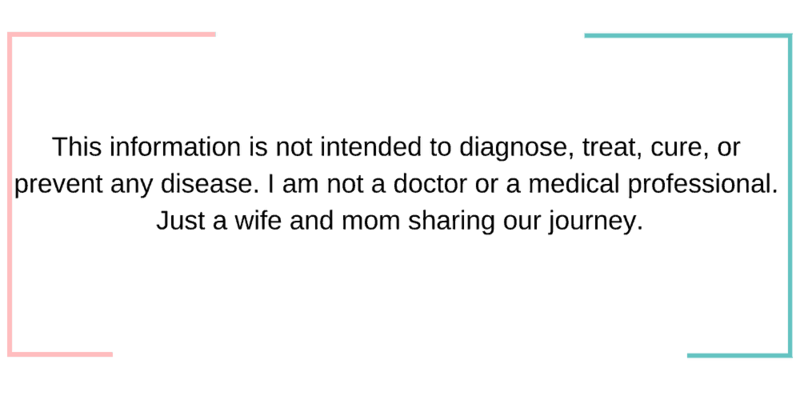 There are festivals held that celebrate ramps and the beginning of Spring that attracts thousands of visitors each year. And you can trust in the fact that many various types of ramp recipes are served at these events! Typically, they are found mainly in wooded areas with a lot of moisture. They’ve been spotted in Canada and as far south as North Carolina. They are not only a sign that Spring is here (who really believes a groundhog from Pennsylvania anyway? ), but they really are a great addition in taste and texture to homemade meals. 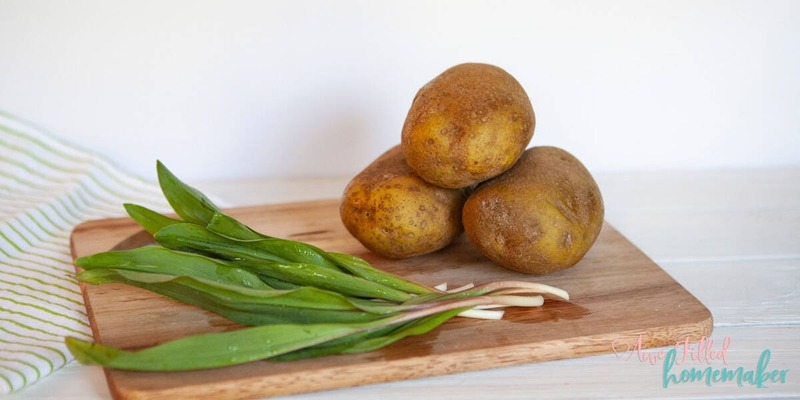 Ready to learn how to make this Fried Potatoes and Ramps recipe? You’re in for a real treat, my friends! 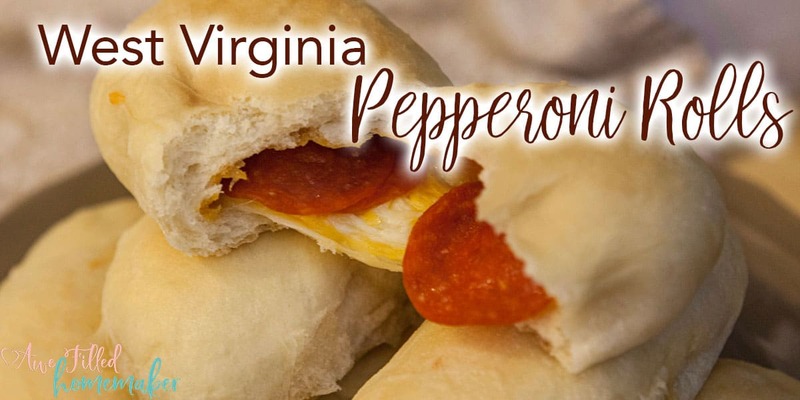 West Virginia Pepperoni Rolls! Y’all, this classic recipe is absolutely famous in my home state. I don’t know of anyone from there who hasn’t tried it. If you haven’t read the history about how this recipe came to be, you definitely want to click over and read it because in addition to the recipe, I also share the history! West Virginia Beans & Cornbread. Beans and Cornbread have been a mainstay at dinner tables across West Virginia for as long as I can remember. I remember listening to my grandpa tell me about his grandparents making beans and cornbread on the farm. Beans and Cornbread is about as classic West Virginia than any dish I could possibly think of. Add in some fried taters & ramps and you will have you a true West Virginia gourmet meal! There’s a bit of history that comes with this recipe, too, so don’t miss it! 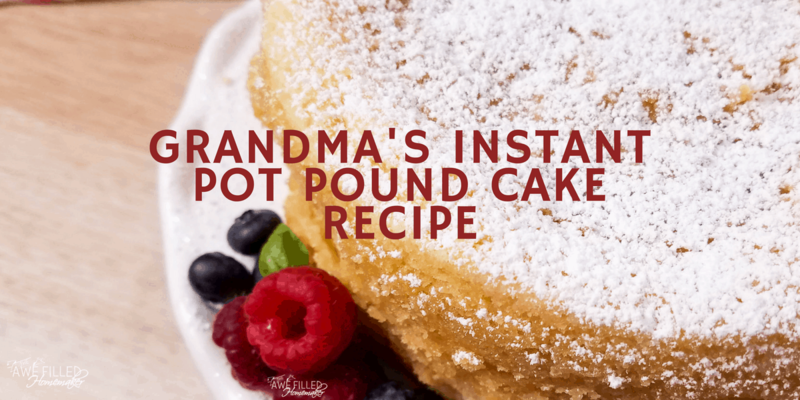 Grandma’s Instant Pot Pound Cake Recipe. My Grandma may not be famous to anyone (except maybe me), but her classic West Virginia family pound cake recipe stood the test of time. 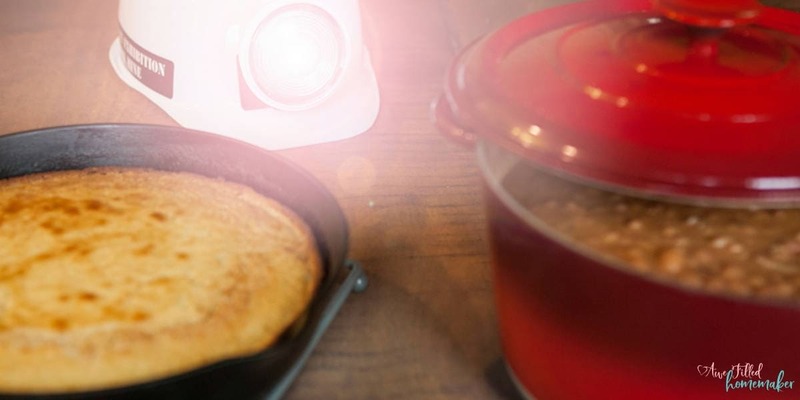 For years I made this on the range oven, but I’ve converted it to an Instant Pot recipe. Come read more about my family and my Grandma while finding out the secrets to this delicious West Virginia Recipe. There isn’t a whole lot of ingredients for this dish, but that doesn’t mean it lacks in flavor! That’s the secret! There’s not a lot of ingredients and yet TONS of flavor! Rinse ramps until cleaned. Cut off roots and any tough leaves. 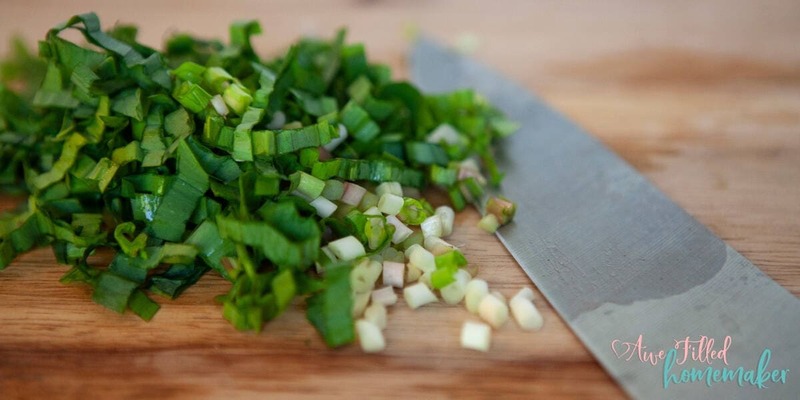 Peel off the translucent outer layer and slice thinly (like scallions). 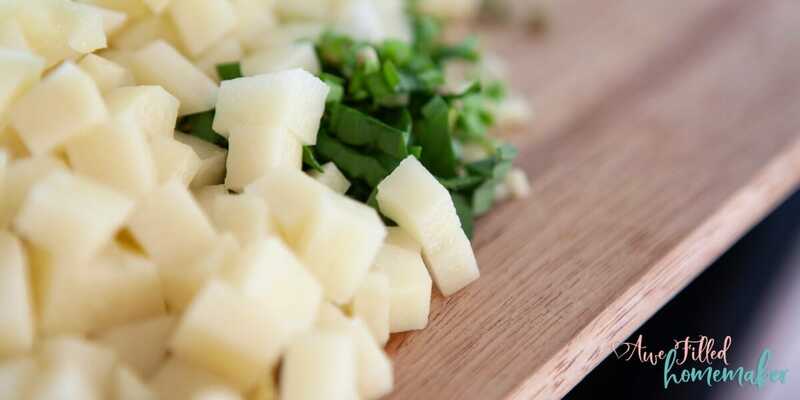 Wash, peel and cut potatoes into small chunks. (It’s important to keep them rather small to cook thoroughly). Heat oil in a cast iron skillet. 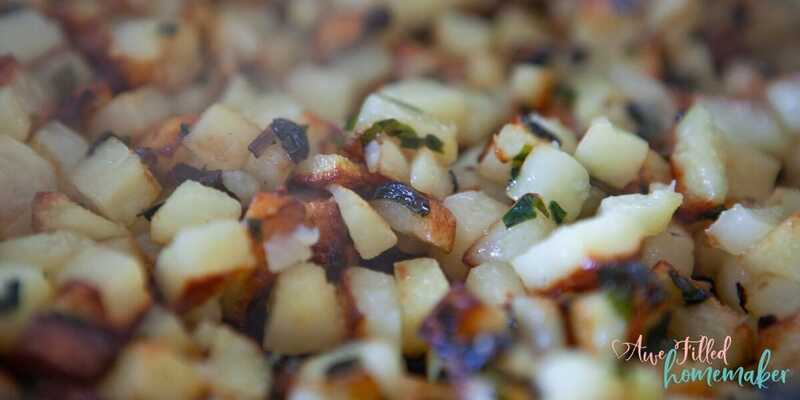 Fry potatoes, turning frequently for about 5 mins then add your ramps. 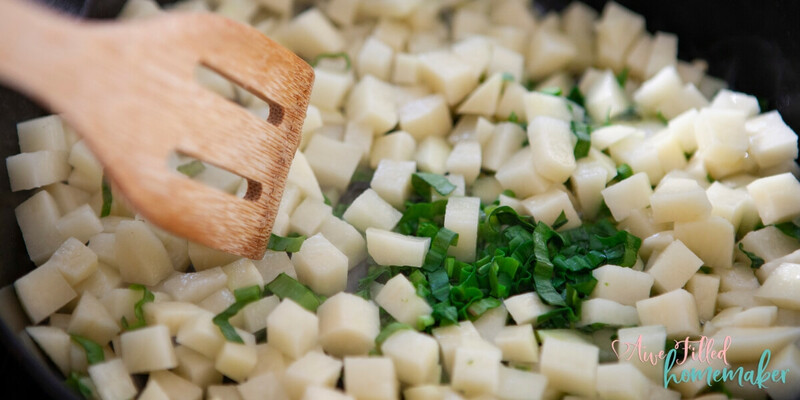 Cook, continuing to turn frequently until potatoes are crisp and ramps are tender. 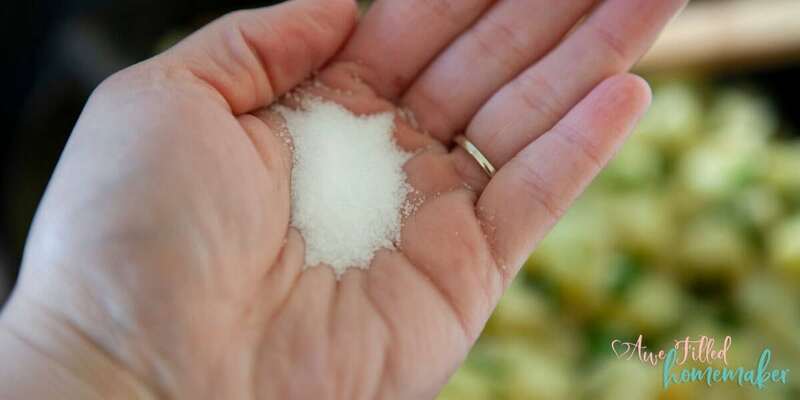 Sprinkle with the desired amount of salt. 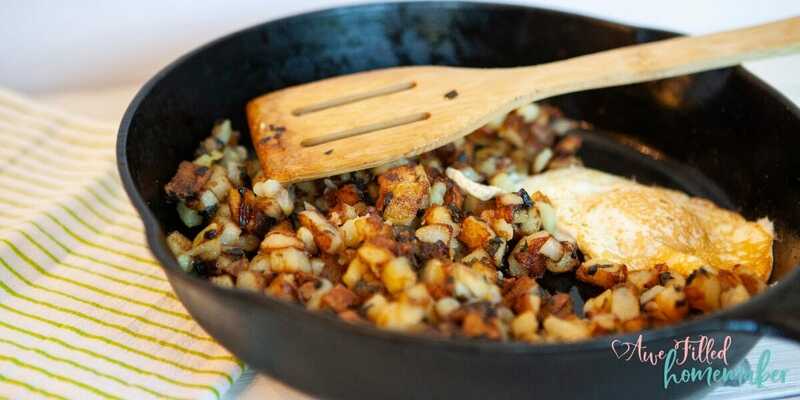 Move ramps and potatoes to one side of the cast iron pan. 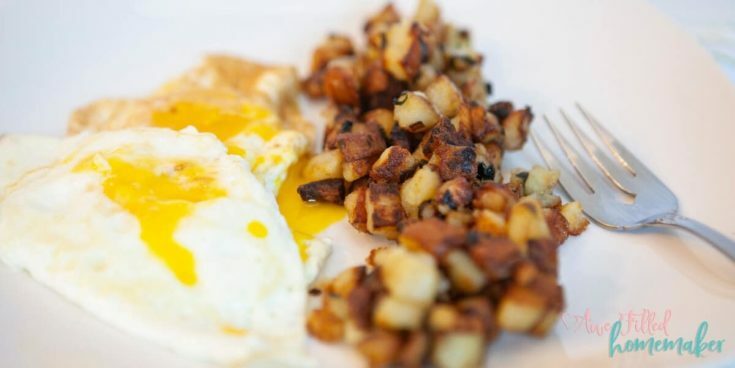 Crack and fry eggs as desired. That’s it! See how simple this recipe is? What else could you serve with this dish? Here’s the deal. This dish is actually pretty versatile. Some people like to eat it as a dinner, while others like to have it for breakfast. To each their own, but if you ask me, I prefer it as a dinner lunch or dinner option. Don’t be afraid to add in some of your favorite spices and seasonings. If you want to increase the heat, think hot sauce, jalapenos, crushed red pepper, or your another spice in your pantry. Anything that you think is spicy might be a fun addition! This can also be a really great side dish with an awesome Instant Pot recipe or two. Can you imagine this as a side with some Instant Pot Pork Bites? Seriously so good! If you’re new to the world of eating ramps, welcome. Who knew this delicious ingredient is grown in the hills of West Virginia? They’re out there. All you need to do is find it, cook it (or eat it raw if you want) and be ready for a delicious flavor. Are ramps good to eat as leftovers? 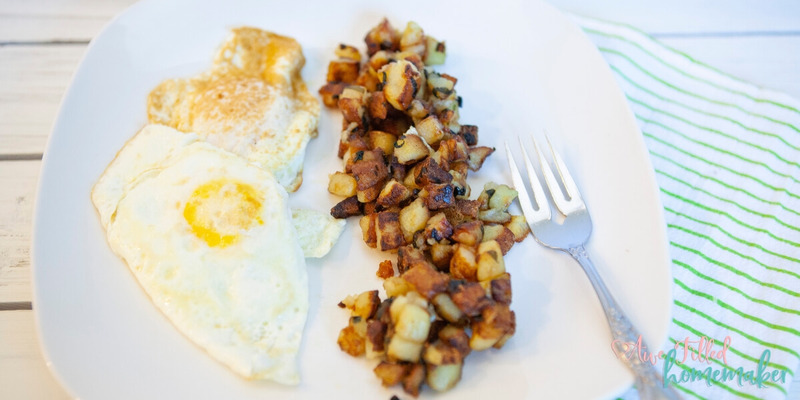 For this dish, there are never leftovers as we eat the ramps, taters and eggs hot off the stove. I personally think that you get the best taste and texture that way for sure. But if you’re eating it raw, you can totally eat it as leftovers from several days without an issue! What are you waiting for? It’s time to give this delicious recipe a go! There isn't a whole lot of ingredients for this dish, but that doesn't mean it lacks in flavor! That's the secret! There's not a lot of ingredients and yet TONS of flavor! Cut off roots and any tough leaves. 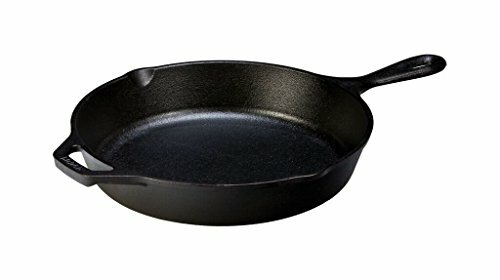 Heat oil in a cast iron skillet. 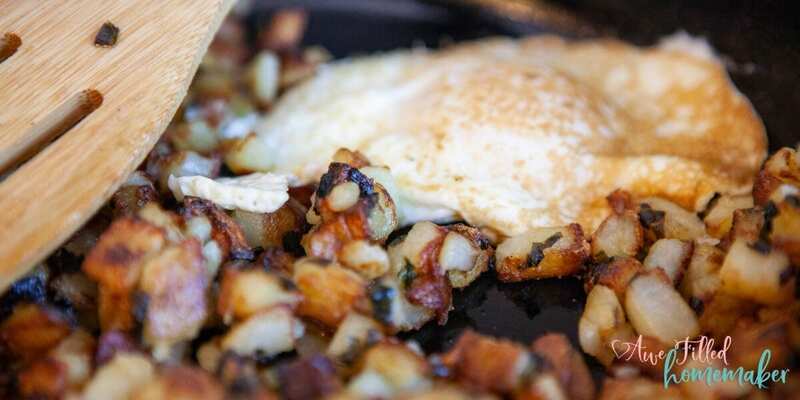 Fry potatoes, turning frequently for about 5 mins then add your ramps. Cook, continuing to turn frequently until potatoes are crisp and ramps are tender. Move ramps and potatoes to one side of the pan. Crack and fry eggs as desired.